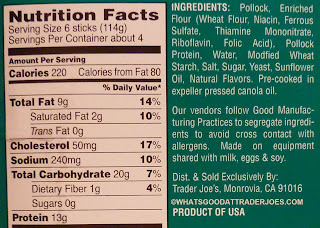 Fish sticks have never been terribly exciting—especially when you start tacking phrases like "reduced fat" on to the title of the product. I mean, sure, one might argue that fish filets, croquettes, and nuggets aren't much better. But to me, they seem a little more "Trader Joe-esque" than just plain old fish sticks do. But I must admit, these aren't bad. The texture of these depended greatly on their time in the oven. One slightly under-baked batch came out soft and delicate, another spent some extra time in the oven and came out crispy—almost crunchy. 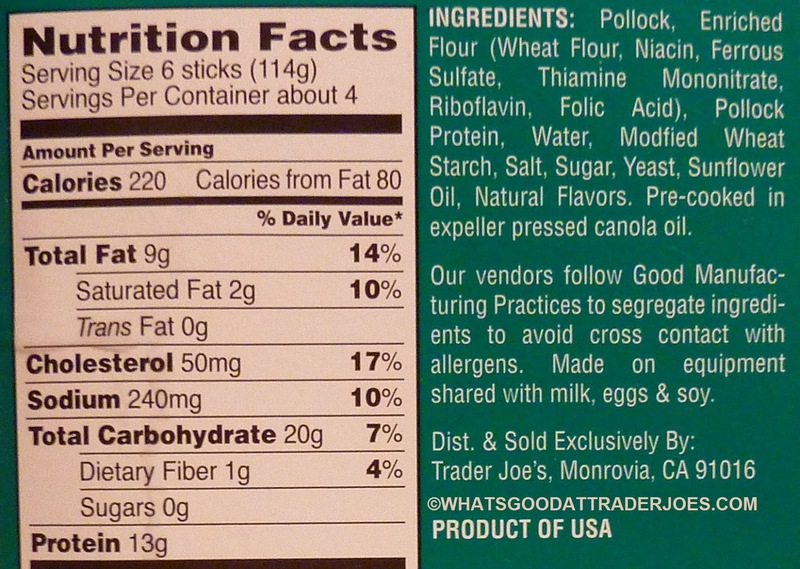 So it's pretty easy to tailor these sticks to your specific taste. The fish was fairly consistently flaky and white, with very few weird, dark spots and irregularities, as I've seen with some other brands of fish sticks. There's a nice, subtle fish flavor here. The breading is indeed light and only lends a whisper of carby goodness to the tender pollock. Overall, though, I thought the product was a little too bland to be eaten sans condiments. Lacking authentic tartar sauce, we whipped up a makeshift batch using Miracle Whip and relish. We applied it sparingly to our fish sticks and found that it worked pretty well. With a salad and some juice, they made a pleasantly satisfying dinner for Sonia and I one evening last week, and there were still enough left over for lunch the next day. There's no reinvention of the wheel here. 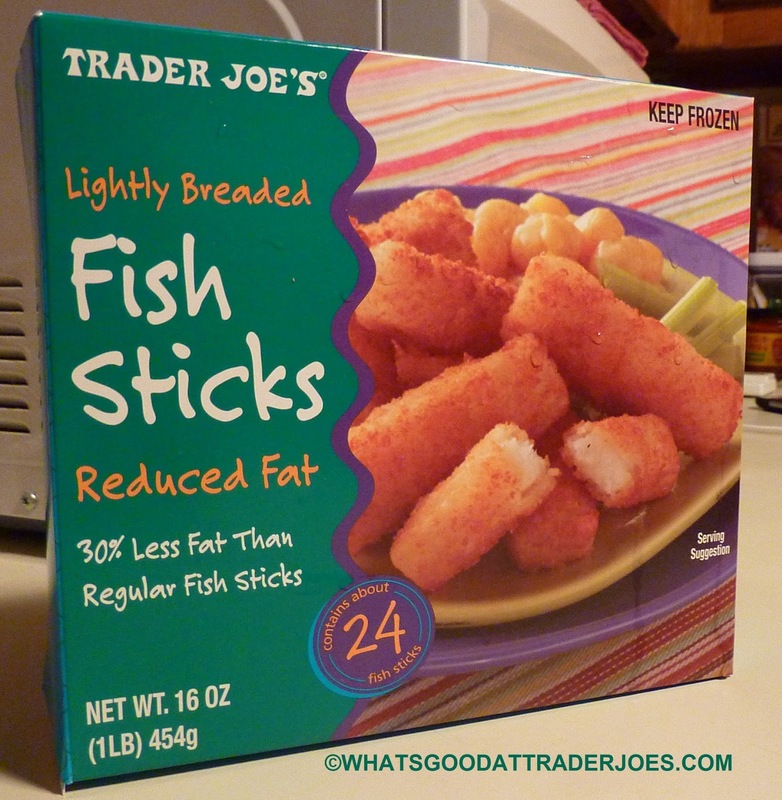 These are solid, palatable fish sticks—even if they are a tad boring. Four stars from Sonia, three from me. Use those for quick fish tacos. My husband is a novice cook and when I went back to school he had to pick up the cooking duties. He uses these and the reduced beer batter fish for fish tacos a night or two a week. It's good!! I need to pick these up. Going to school and working means not much time for cooking. Bar exam in July! Fish sticks it is. Cool! Good luck on that bar exam.